This month’s Weekend Cookbook Challenge, hosted as always by my girl Ali at Something So Clever, was to cook something orange. I hate carrots so that was out. Persimmons? I’m stumped when it comes to them. I started remembering an orange salad dessert in Jamie Oliver’s cookbook Jamie’s Kitchen. While I love the photos in his books – and I have several of them – I can’t say I’ve made too many of his dishes. Something light and citrusy was the perfect way to celebrate the incredible weather we’ve been having in Atlanta. I wore a sundress on Sunday! This couldn’t have been easier to make – I think it took me 5 minutes to put together. I did tweak the recipe a bit. Instead of clementines, I used Satsuma oranges that I bought at the farmers market this weekend. I omitted the mint and used Dagoba’s chocolate flavored with Lime. It was just noticeable enough to add something to the salad. I’m sure the mint is lovely, too. Peel the clementines, slice across thinly and remove the seeds. 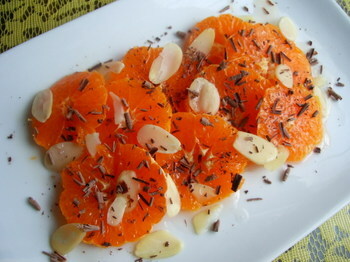 Arrange on 4 plates and sprinkle over the almonds and mint. Bring the sugar and water to a boil, add the vanilla seeds and allow to simmer until the liquid becomes a light golden syrup. Try not to touch it too much at this stage. Drizzle the syrup over the clementines and top with the shaved chocolate before serving. Very inviting indeed. Fresh fresh fresh! Ooohh, my favourite combination – chocolate & orange! Fab! nice work. in my crazy life, if i can stop by to see more, i will. Such a treat to follow your blog. Your latest salad is true eye candy and delicious sounding. Rock on! Gorgeous, easy, and delicious is a nice combination. Just beautiful — just perfect! Thanks for this fine recipe! It’s great and you look pretty fine too.. Cheers! do you buy shaved chocolate or shave it yourself? if so how do you shave it?